It's seems it was only yesterday that we celebrated the coming of 2012. Now, we are about to welcome another new year! Unlike all the years that passed, I'll be greeting 2013 differently. But I don't want to bore you with my drama. So let's just proceed with how I'll be wearing my nails for the new year! I wanted something colorful, dainty, and fun. I've actually done this nail design before. I called it Fun With Flowers. And I thought I'd recreate it using a different color palette. I figured it would look great for the new year. Well, it's more of like it has an underlying for me. More on that in awhile. I named this A Blooming New Year simply because the design is floral. "Blooming" is how I want 2013 to be ... in all aspects. Did that make sense? I used 3 thin coats of Dazzle Dry White Linen, which I thought would be a fab background for the idea. It was a debate between a pure white polish and this. The latter won. Not so sure I was ready for a pure white manicure that I'd wear for a few days. I hand painted the design using acrylic paints and a detailing nail art brush. As for the color scheme, I decided to use 3 colors -- light purple, orange, and blue. You might ask, why not red? Well, I really don't have a good reason for that except that I wanted to use colors that I don't normally choose. It's actually part of my new year resolution to be more adventurous when it comes to polish or design colors. 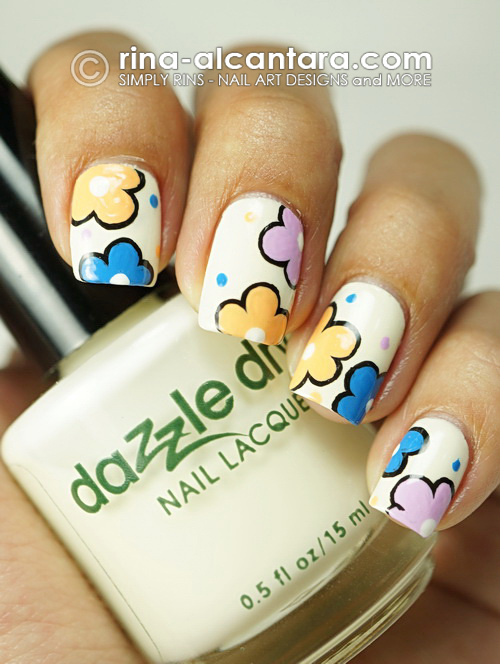 This floral design is relatively easy to do because you'll be painting big shapes. I painted the black outline first before I filled it in with my chosen colors. I always find this a more easier way to do outlines. I also added a few dots to fill in awkward spaces. Hopefully, you liked my New Year nail design. 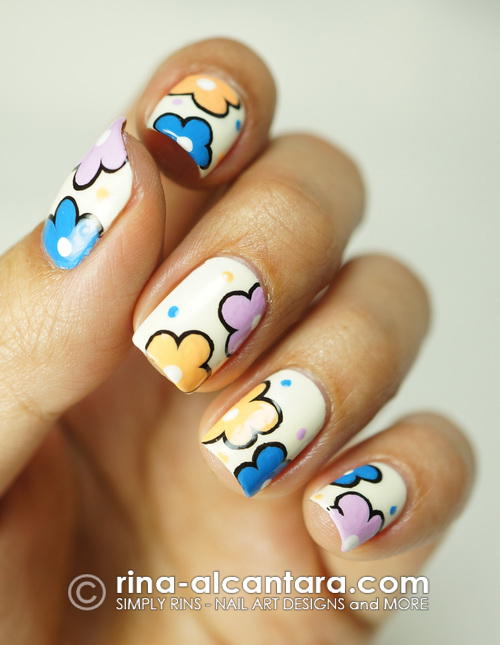 I know it is not the typical new year nail art idea. But I feel it would fit the celebration. I know that whenever I'll look on my nails during the countdown, I'll be hoping for a blooming 2013. And I hope that yours will be, too. Happy New Year to everyone! Cheers! ah! you amaze me every time! Very cute but I think it would be better for Spring. Although it is nice to see flowers this time of year lol. Right now I'm looking forward to seeing the colorful fireworks!! Happy New Year! I love these cute flowers. You're very talented!! galing talaga.. you make me wanna try using acrylic paints. I'm so happy I found your blog :D hehehe. btw, when you ordered from bornprettystore, was your parcel delivered to your doorstep or did you have to pick it up at the post office? any tax or tariffs? Let me know if you already tried tried acrylic paints for your nail art. And I'm happy that you found my blog, too. A fellow Pinay nail artist, yey! Sadly, I had to claim my package from Born Pretty Store from PhilPost in Pasay. Yes, I incurred duties and taxes because it was an international purchase.